For the owner who wishes to engage with their sailing and yet can also satisfy the needs of family and guests. Modern, functional, capable of fast transoceanic passage making, effortlessly transporting owners and their guests in style and comfort over long distances, combined with being a luxurious home at anchor in remote bays for significant periods. Key to the concept and where often large sailing yachts can be compromised is the ease of running the deck and handling a large sail-plan with a small crew. 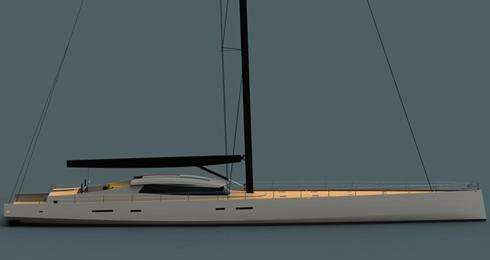 In terms of performance we have created a modern comfortable sailboat that retains the connection with the elements, a yacht which is both responsive and exciting to sail and where the main engine can be quietly relegated to in-port manouvres. Key to the concept and where often large sailing yachts can be compromised is the ease of running the deck and handling a large sail-plan with a small crew without modifications to re-configure the boat for different modes of sailing (regatta, oceanic or coastal cruising). 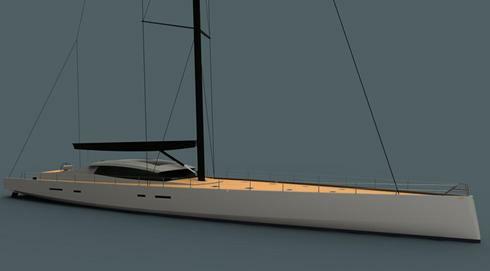 From the performance side, the main target was not just to create a modern comfortable sailboat, but having the ability to retain the connection with the elements, a yacht which is both responsive and exciting to sail and where the main engine can be quietly relegated to in port manoeuvres. The hull and appendage configurations are the latest in modern thinking within the bounds of readily maintainable and manageable technology and evolved from Owen Clarke’s latest development work for their race boat designs. The hull by nature of its Open Class Yacht pedigree is both voluminous inside and can be sailed at more comfortable low angles of heel compared to more conventional designs. The dreadnought bow offers a maximum waterline length, reduces the yacht’s displacement to length ratio and provides a safer and more secure deck space to tack spinnakers and furling gennakers without the additional complication of a bowsprit. Fast, with fine forward sections to the hull and with aggressively chined aft quarters, combined with her twin rudders exhibiting the high levels of directional stability and control that are par for the course with a race boat that has to be sailed solo, day in and day out under autopilot, non-stop around the world. 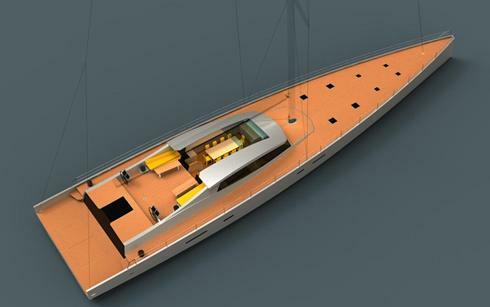 The keel is lifting, with a range of over 2m and a max sailing draft of 6.6m. This provides a sufficient aspect ratio required for windward/reaching performance and a bulb weight that optimises high stability for a moderate displacement, yet still enables access to those more remote locations. The sail plan is both powerful and controllable, set on a carbon three spreader rig and incorporating many of the latest developments in short-handed sail handling technology, scaled up and applied to the challenges faced on modern superyachts. Featuring a two speed hydraulic furler at the bow that can handle both top down furling spinnakers as well as the conventional furling code sails and jib tops. The high aspect ratio non-overlapping jib is set well back on its own dedicated hydraulic furler. A Staysail and an ORC storm sail with individual tack positions are spaced along the foredeck with separate mast locks and removable furling stays. ‘Bomb bay’ doors let into the foredeck cover large self draining lockers for the working sails so that the crew are spared the effort of stowing them in deep lockers. All halyards and the mainsheet are on captive winches, with headsail and spinnaker sheet winches in the central cockpit and aft deck respectively. With the emphasis on comfort on deck, as this is a focal point, whether underway or alongside/at anchor the owner and guests have three separate areas in which to relax, away if they wish from the sailing activity of the yacht. The owners have their own private (if they choose) aft terrace on the sea with direct access to their accommodation. (Under the aft deck terrace is space for a substantial tender and associated water toys nested between the twin rudder stocks) The elevated sun lounging deck separates this area from the central cockpit which is at the same time a practical protected safe haven when sailing offshore, as well as a comfortable outside dining and lounging area. The wide side decks around the superstructure connect the aft terrace to the clear uncluttered flush foredeck and discrete ‘gates’ in the coamings enable access to the cockpit. One of the prominent features of this sailing yacht is the large sliding glass section of the coachroof which retracts to provide enhanced ‘al fresco dining’ with the full facilities of the saloon area available under a closed or open roof and aft bulkhead. The deck saloon incorporates a dining area for ten, large sofa seating area, sideboards and dedicated bar facilities. With the rise in demand for private yacht owners chartering, the interior layout presented here offers five owner/guest cabins with the full width owner’s stateroom leading onto the aft terrace. The guest cabins can be modified to suit either twin or double bed arrangements and additional pullman berths can be fitted to the forward guest cabins to offer even greater flexibility. OCD have also designed a four cabin version of the same yacht in which the owner’s stateroom is replaced by a private lounge and dining area along with an adjoining owner’s stateroom. Access to the aft guest/owners areas are from the main saloon, in both versions the owner/guest areas extend to being adjacent to the mast with the raised main saloon dominating mid-ships. In line with practical and seamanlike aspects of the design the main saloon also incorporates a navigation/watch keeping station with the same panoramic views afforded to the guests when dining or relaxing. Under the raised saloon sole is situated the main machinery space with walk in access from the lower forward level adjacent to the main keel casing. This feature allows easy access to the main machinery and systems yet is discreet enough to have no ergonomic impact to the owners/guests. As is commensurate for a yacht of this size, the interior also incorporates more practical features such as a day heads for guests under the main cockpit/saloon companionway and a separate laundry forward of the crew quarters. The galley area is expansive enough to incorporate food preparation and plating up areas. The skipper and crew are accommodated forward of the main galley and ships office and incorporate separate open plan crew mess, dedicated skippers double cabin and further cabins for four crew. Further stowage facilites are accommodated in the expansive forepeak area.